This is an item from the May 27 council meeting agenda that I’ve been meaning to address. It’s about a water main project on South 4th Street. This project would have abandoned a 6” water main on the west side of Route 23 (South Fourth Street) from Lacas Street south to approximately 110 feet south of Charter Street. There are approximately twenty services that would have been be disconnected from the 6” main on the west side of Route 23 and be reconnected to the 8” main on the east side. The project was already coordinated with the Illinois Department of Transportation, which is planning to resurface Route 23. It does make sense to do the underground work first if possible. 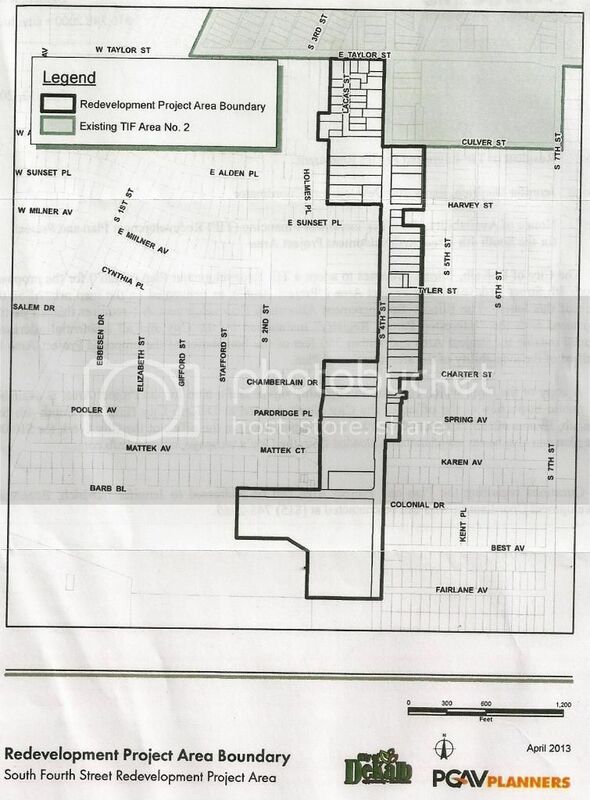 The following is a summary of documents obtained from the City of DeKalb involving a group from the 5th Ward, the City of DeKalb, and the Center for Governmental Studies (CGS) at NIU. The 5th Ward group was first called a “task force” although it has never been an official city committee. Now, the informal association is known as the Ellwood Historic District or Ellwood Historic Neighborhood. Fifth Ward Alderman Ron Naylor seems very proud that the FY2011 budget is down $700,000 from FY2007. I went through those budgets and counted more than 40 positions eliminated since FY2008 — but, assuming a little hiring has been done this past fiscal year, let’s say we’re down about three dozen. There’s been virtually nothing spent on equipment, in fact personnel account for 89% of expenditures now, according to the FY2011 budget. And with the recent exception of fuel costs, commodities have been pretty stable for a couple years. I am guilty of too much talk and not enough homework done this week. There is indeed a scenario in which Alderman Ron Naylor paid the Ellwood House room rental for a 5th Ward meet-up, even when there’s a “RM RNTL 5TH WARD 1/19/10 MTG” note in the city’s check register. The scenario is more than one 5th Ward meeting having taken place. I mistook the 1/19 meeting for his “coffee,” and did so in error. I am sorry for the mistake. First, the Hope Haven expansion vote. The good folks at HH have been raked over the coals for two months and it’s finally over. Many thanks to Mayor Povlsen and Aldermen Simpson, Teresinski and Verbic for their “aye” votes. Hat tip to Alderman Naylor for alluding to the double standard used for HH and the other residential project on the front burner — oh, and if you want to argue it’s apples and oranges, fine, but let’s DO have the argument. Fourth Ward alderman Brendon Gallagher gets the “Let Them Eat Cake”/juxtaposition fail award for mentioning his country club hobnobbing during the annexation hearing and then vigorously rejecting a proposal that would help people down on their luck in his own ward. As for Alderman Kammes of the 7th, it’s a funny dang time for her to start responding to e-mail, but, whatev.